'NOTES OF LOVE' OUT NOW!! Leading West End talents Oliver Savile (Wicked), Siubhan Harrison (Guys and Dolls), Rob Houchen (Les Miserables), Sharon Sexton (Bat Out Of Hell), Stuart Matthew Price (Rocky Horror Show), Jodie Steele (Heathers) and Sooz Kempner (Get On With It) sing a collection of original Musical Theatre ballads by Oliver Boito, ranging from the epic to the intimate, each with its own story representing love found, lost, defended, sacrificed and celebrated. 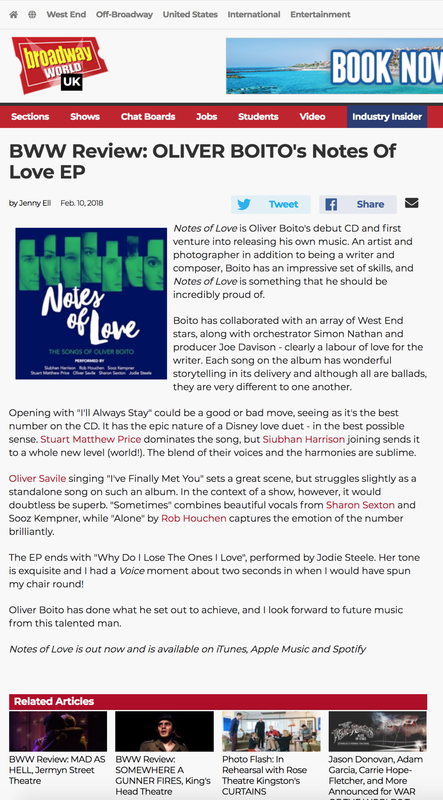 Performed by some of the West End’s leading artists, Notes Of Love is Oliver’s debut EP of original compositions in collaboration with orchestrator Simon Nathan, and producer/arranger Joe Davison from Auburn Jam studios. Notes Of Love is an exploration into the power of song to express the inexpressible, and touch on the emotive forces and impact of love in its many guises. The songs range from epic and timeless orchestral arrangements to the more contemporary purity of piano and solo string, each composed to deliver evocative stories, melodies and emotions that stir imagination and grab the heart. Copyright Oliver Boito 2017. All Rights Reserved. Unauthorised copying, arranging, adapting, recording or public performance of these works is an infringement of copyright, liable under the law.